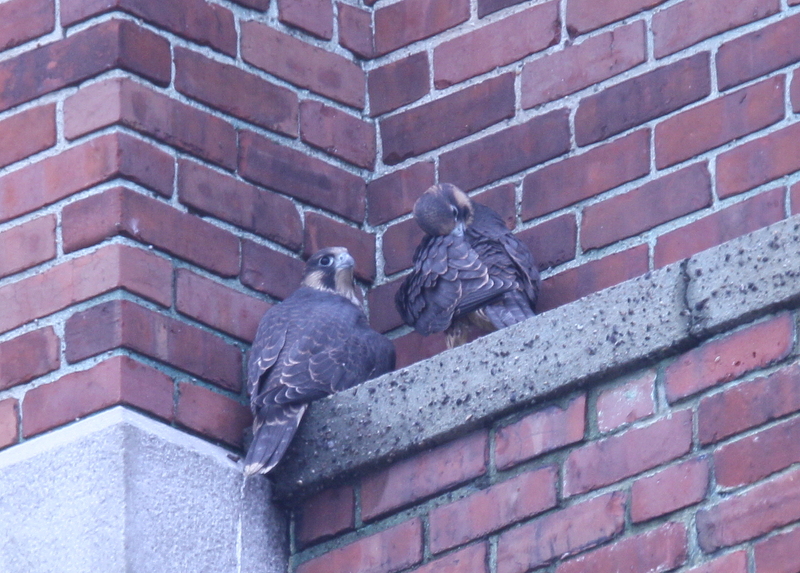 You are browsing the Blog for peregrine falcons first fledge. 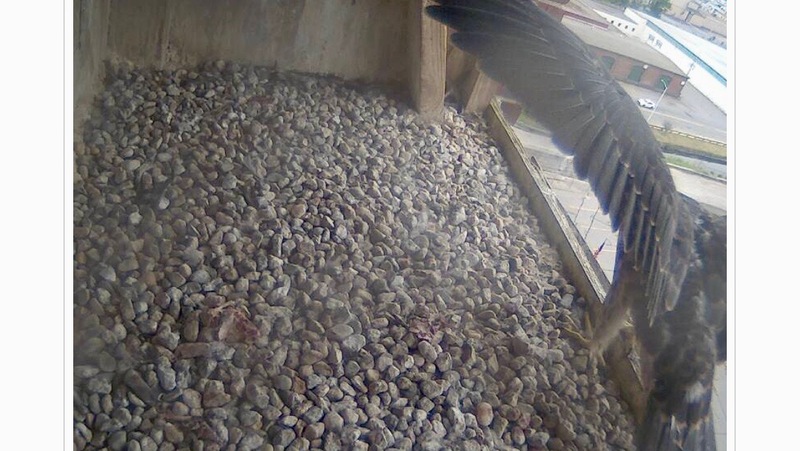 After a few days remaining in the nest box, the third and final chick fledged on Thursday. 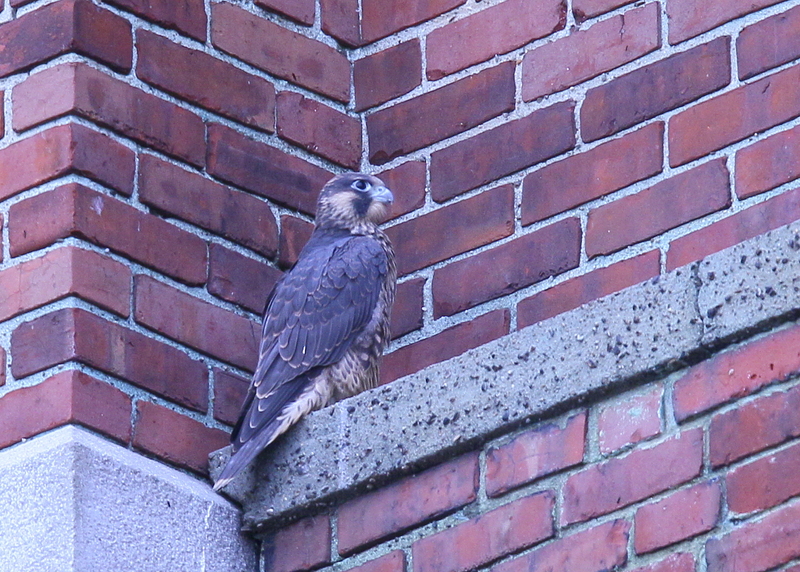 In the late afternoon, had a nice opportunity to observe the fledgling on a lower ledge closer to Merrimack Street. 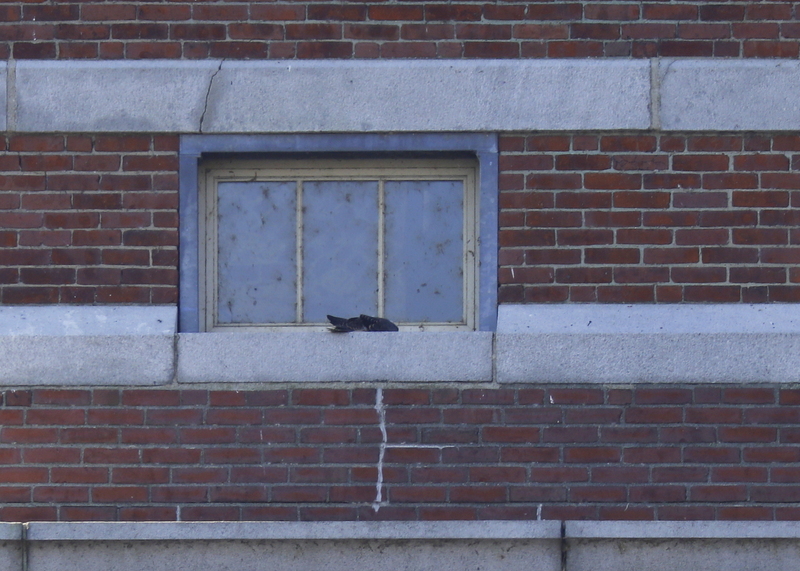 It was testing its wings and hopping along a ledge. Not only a treat to watch from a close vantage point, but also had the chance to observe and document the black/green bicolor leg bands used on peregrines in Eastern United States. This fledgling has black numbers (59) over green letters (BD). 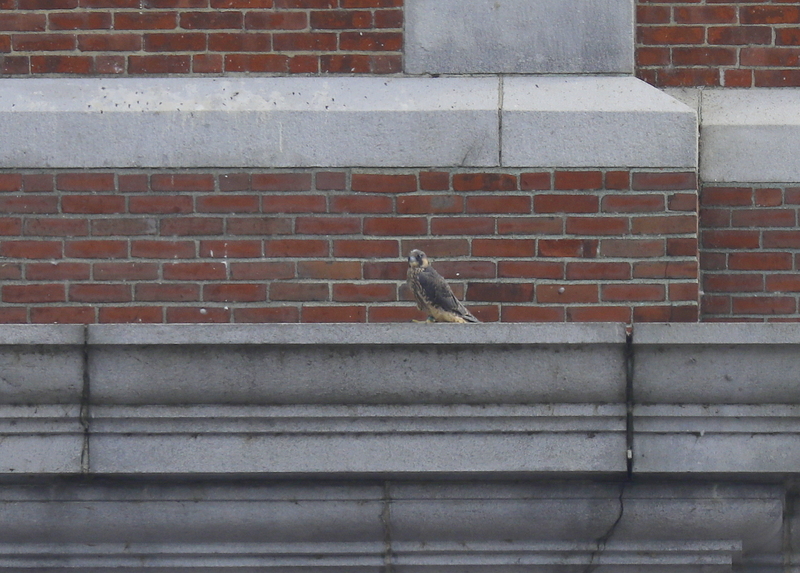 The fledglings continue to be seen in a variety of locations around the Clock Tower with one of first two fledglings remaining for a day on a nearby ledge. The older fledgling has flown to upper ledges and even atop the weathervane at the top of the Clock Tower! Peregrine chicks; 2 fledge over weekend! 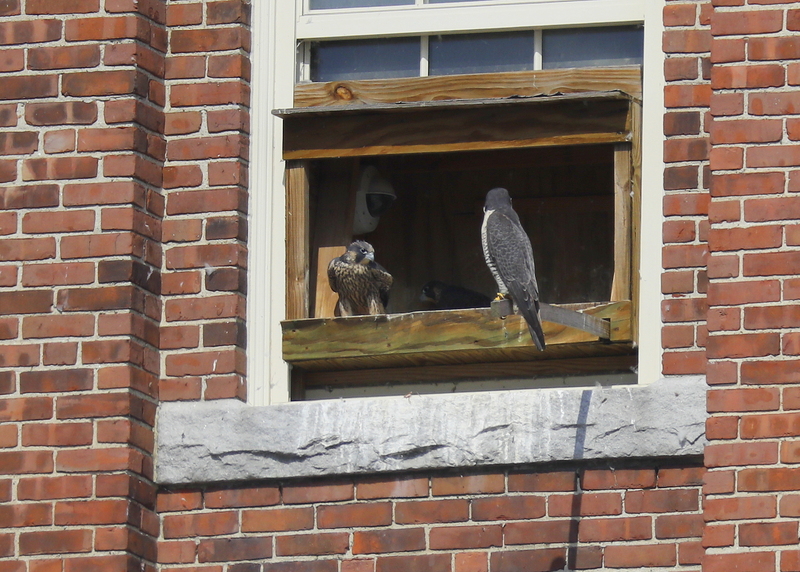 The peregrine chicks took their first flights away from the nest over this past weekend. Not always choosing to or being capable of returning to the nest site, they will be found in different locations around the Clock Tower like these 2 on a nearby lower ledge! Peregrine fledglings experience the joy of flight! The fledglings are having a blast learning how to fly. 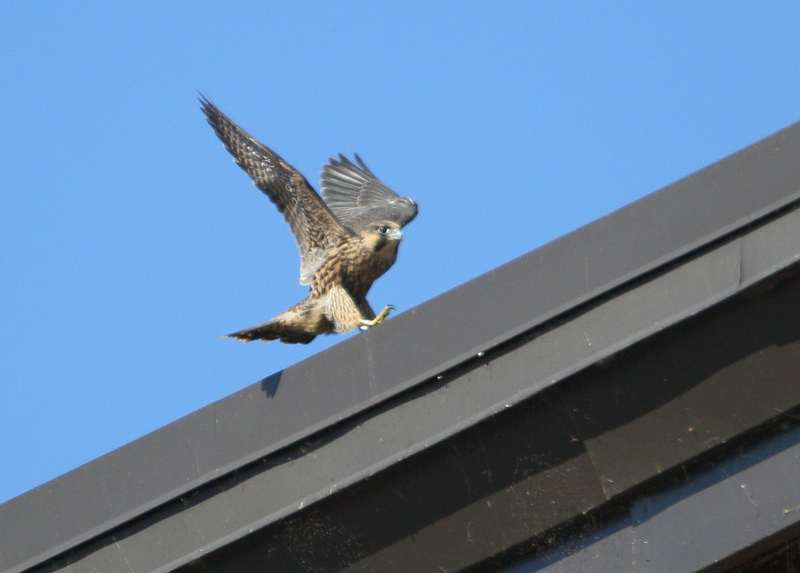 They have abundant nearby rooftops to practice short hop flights, glides and landings. You can almosy sense their joy as they make endless short hop flights. What a pure delight to watch! On Wednesday afternoon we finnaly were graced with bright sunshine. 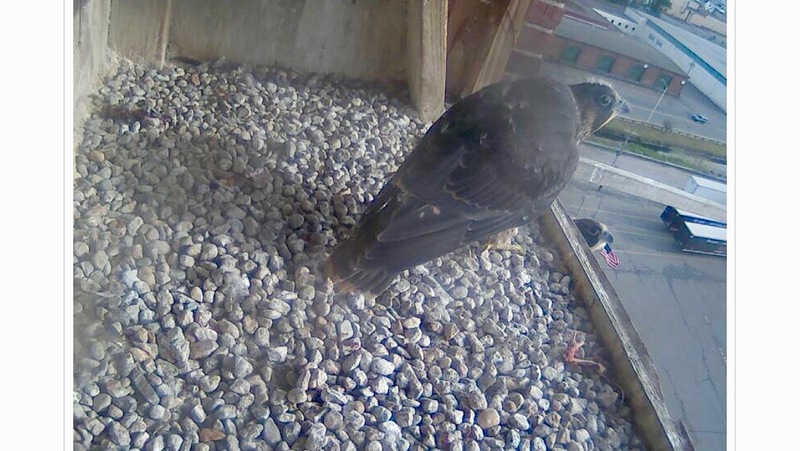 What a joy to watch the peregrine chicks again as they hopped, skipped, jumped and even got airborne at the west end of the New Balance west wing roof. 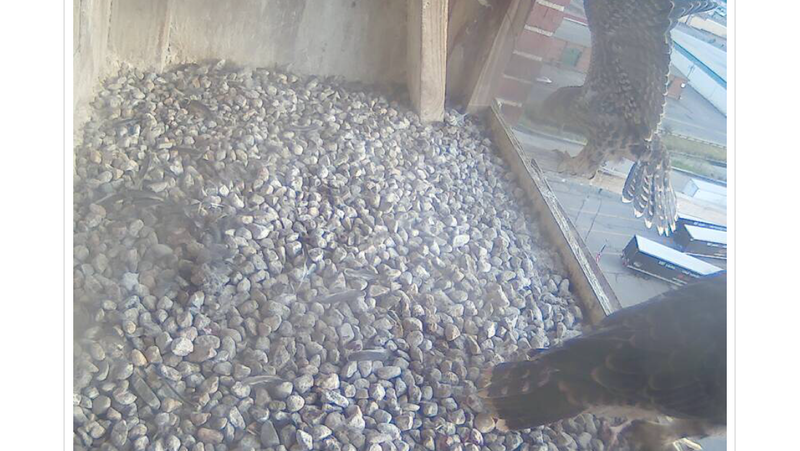 Fascinating to watch how the parents guard from a safe but close distance. 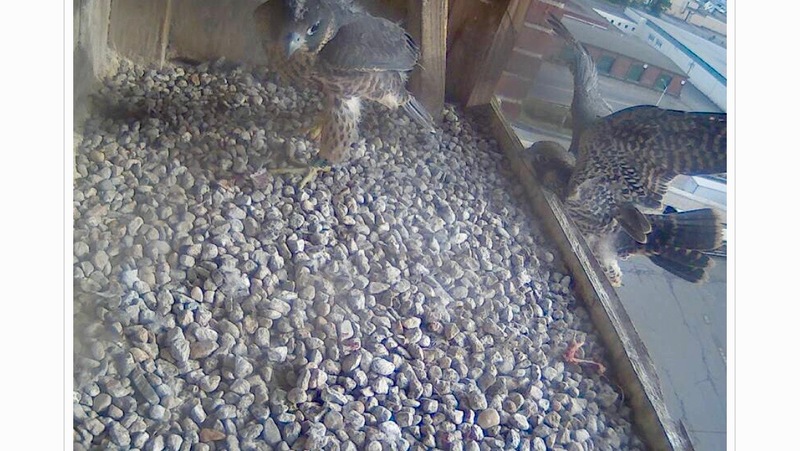 Kind of like attentive lifeguards at the beach, the adult Peregrines miss nothing! 8 Photos posted: http://www.pbase.com/birdshots/image/143865500 Click “next” in upper right to advance frames. 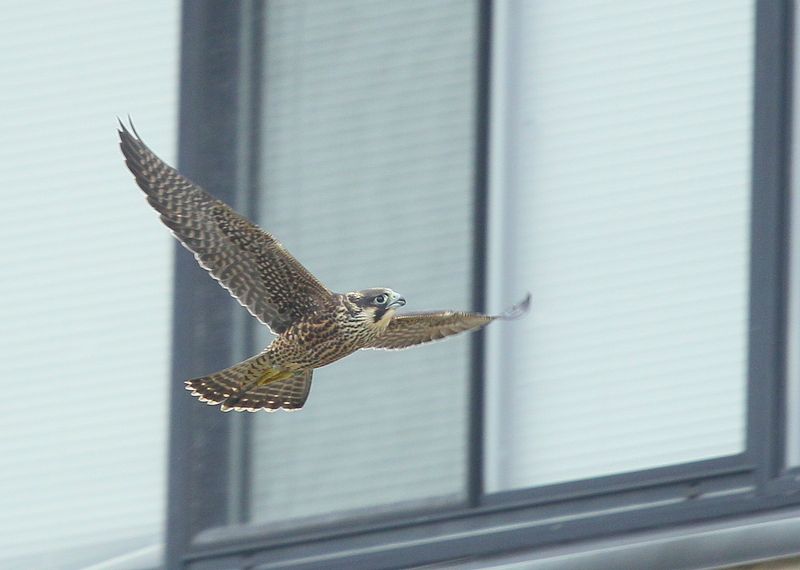 According to Cornell’s Birds of North America online entry for Peregrines: Flight progresses from Butterfly-Flight (1–2 d after first flight) to Flutter-Glide (3–9 d) to Powered Flight (15–25 d). Butterfly-Flight appears to be weaker form of Flutter-Glide associated with in-complete development of flight feathers and pectoral muscles. Pursuits gradually become more sustained and range farther from nest. Adult pursuit is accompanied by Begging vocalization. During first 2 wk of flight, young birds’ pursuit of parents takes precedence over most other activities. Young will even pursue parents during territorial defense (Sherrod 1983). As young become more aggressive toward food-delivering parents, adults sometimes begin to drop both dead and live birds in air. Young pursue and catch these items. Has been interpreted as parental training of young to hunt, but may simply be way for parents to avoid being mobbed by hungry young (Sherrod 1983).